Sweet Spicy Thai Basil Tofu Skewers: These delicious and juicy skewers are vegan, glutenfree and made using a fingerlicking sweet-spicy Thai-basil homemade sauce. Happy Friday You’ll !!! 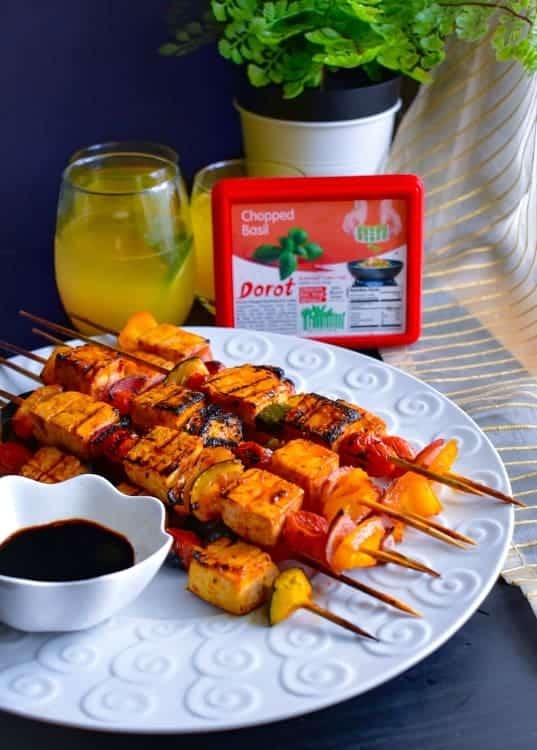 Hope you had a nice week and I’m so looking forward to the weekend and noshing on these Sweet Spicy Thai Basil Tofu Skewers with some Thai ice tea. 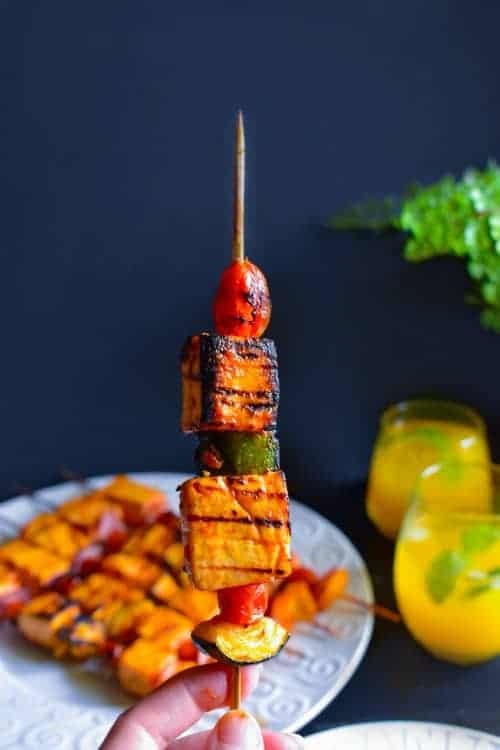 My week was a mix of blah in the beginning to absolutely crazy until yesterday … and today I’m absolutely excited as I get to share the recipe of these superhit skewers with you. 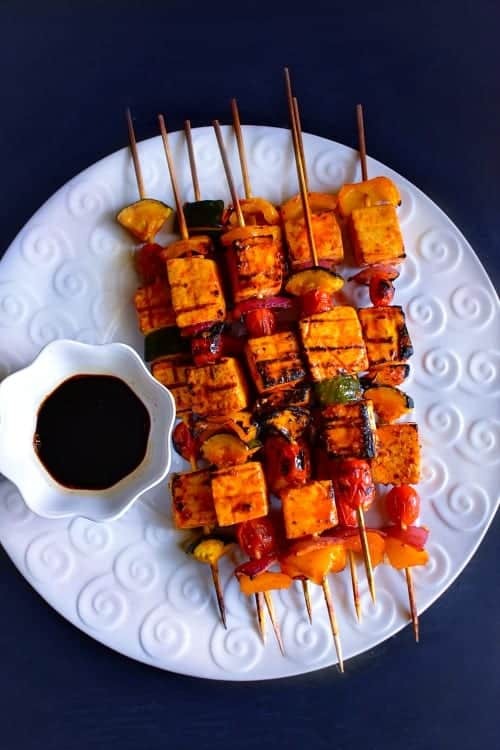 So, my girlfriends decided to throw an impromptu Girl BBQ party yesterday and I was asked to get these Sweet Spicy Thai Basil Tofu Skewers on Wednesday night …. But I guess they know me really well or as my hubby calls it ‘food hoarder’, I confess I always have tons of stuff in our kitchen pantry (as if I’m never gonna go to store ever) and the fridge. The only thing, I was little scared of was that I don’t have any fresh herbs at home and these skewers needed ‘basil’. But then these ‘Dorot chopped Basil’ came to the rescue as I always have them in my freezer. If you do a lot of cooking and like the smell of that fresh herb in your food, then Dorot is your BEST Friend !!! I’m telling you and you can thank me later 😉 they have these clean, cute and pre-proportioned herbs (cilantro, basil, garlic, ginger, etc) all packed in a small little-frozen baggie. ” Dorot start by growing their our own garlic, basil, cilantro, parsley, chili, and ginger. At peak freshness, they pull their products from the fields, process and flash freeze into convenient trays within 90 minutes of harvest. 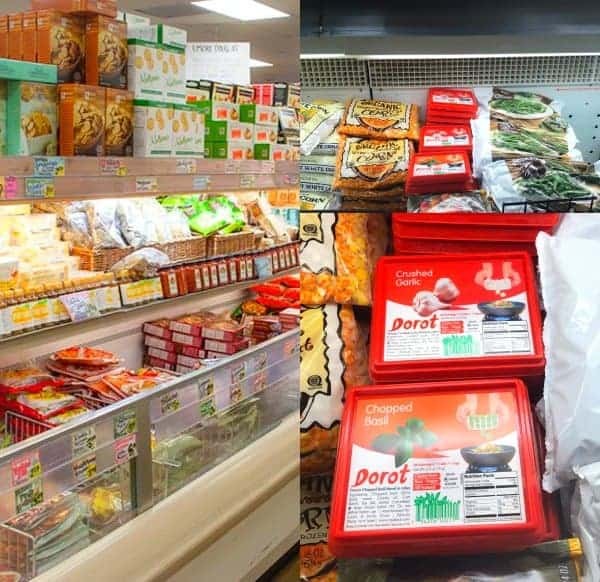 I got mine from ‘Trader’s Joe’ in the frozen food aisle (picture below) but definitely, go to their site here -> Dorot <- and find your local store. Phew, what a relief !!! So, here I was on Thursday morning marinating the veggies+tofu with the spice-mix and I’m talking 9 am as the BBQ starts at 11 am, yep, that’s the chosen time. I just marinated the whole mix for about 15 minutes but if you have time, marinate them for longer. Yep, that would be me, I just started the grill at 9 am and these cuties were ready to be grilled by 9:20 am. I just grilled them each side for 2-3 minutes (as the grill was really hot) and keep an eye on tofu as it burns easily. Once, they were grilled and the Sweet Spicy Thai Basil Tofu Skewers were all ready, I just sprinkled a little bit of lime juice to keep them fresh and juicy. The grill marks look really awesome on them and it’s such an easy peasy recipe that can be added to any of your instant or upcoming BBQ parties. It’s also totally #Vegan and #Glutenree as a couple of my friends are on V+GF diet. So, go ahead and get those grill started and make these delicious Sweet-Spicy Thai Basil Tofu Skewers. Go get these ‘Dorot’ product to help you in your next cooking preparation. 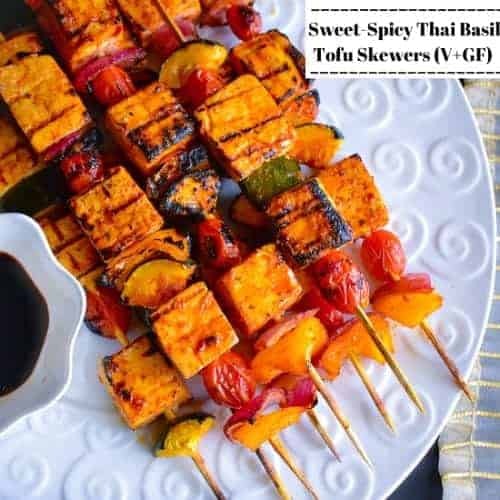 Sweet Spicy Thai Basil Tofu Skewers: delicious and juicy skewers are vegan, glutenfree and made using a fingerlicking sweet-spicy Thai-basil homemade sauce. * If using wooden skewers, then soak them in water for 15 minutes (this prevent skewers from burning). Add all the spice mix in a bowl and whisk to form a smooth paste. 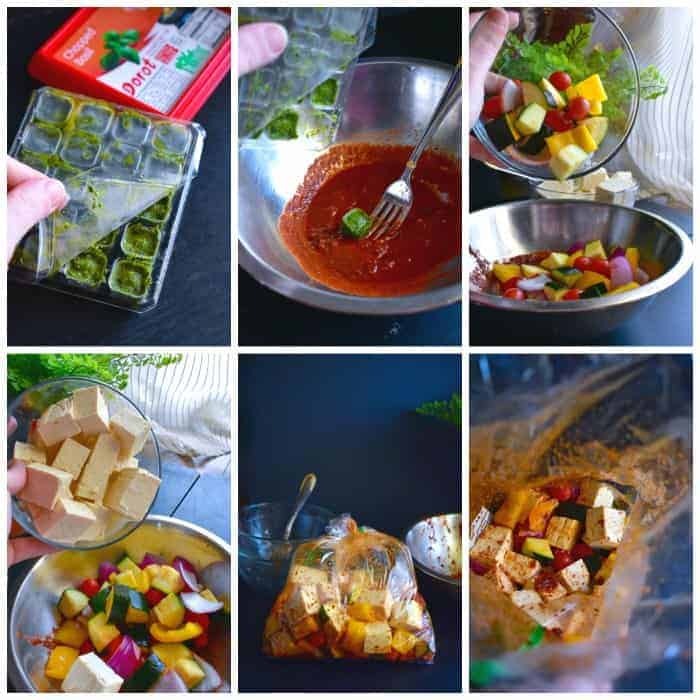 Transfer the content of the bowl in a large ziploc bag and mix everything in it. Keep the ziplock bag in fridge for 15 minutes or longer for the veggies, tofu to absorb the spices nicely. Fire up the grill and add wood or coal as per choice. Remove the bag from fridge. Add veggies and tofu on each skewer (as per choice). Brush each side of the skewered veggies+tofu with oil and place on grill. Turn to another side and grill another 2-3 minutes (keep an eye as tofu burns easily). Once the veggies are cooked, remove skewers from the grill. Transfer to serving plate and serve along with tamarind sauce or any other sauce. 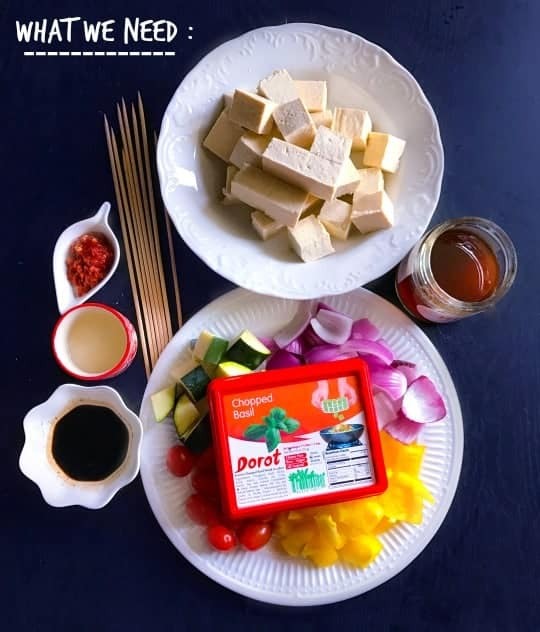 20 Replies to "Sweet Spicy Thai Basil Tofu Skewers #thai"
I LOVE dorot!! They work so amazingly for this kind of thing. So convenient, so fresh – so DELICIOUS! What a great recipe for the grill! Always looking for more veggie friendly recipes! 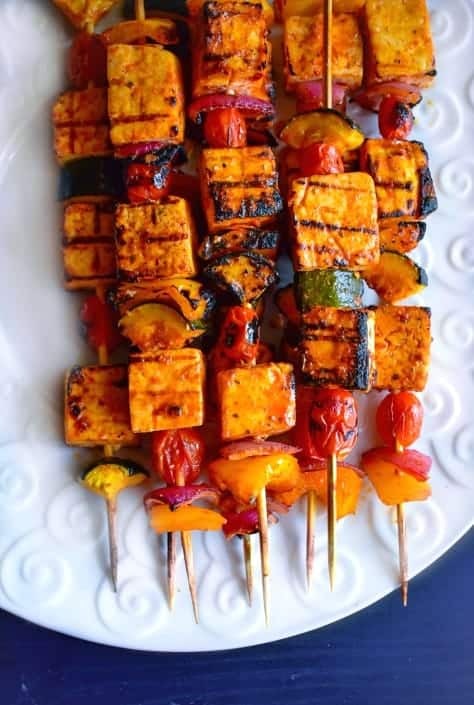 I have never tried to grill tofu, l am obviously missing out big time, these skewers look great. Basil makes everything taste great, isn’t it? I love the great colours, I m getting pretty hungry now. I need to look for Dorot. Your tofu skewers is delicious adding spicy touch to tofu always does wonders. I like spicy tofu rather than soyasauce one. Next time when I plan to grill I am going to make your marinade. These are gorgeous. I’m not vegan, but I would have no problem enjoying these. I have to share this with my vegan-gf friends! These tofu skewers sound so delicious. I haven’t tried any tofu lately but this sounds like a Yummy way to do it. 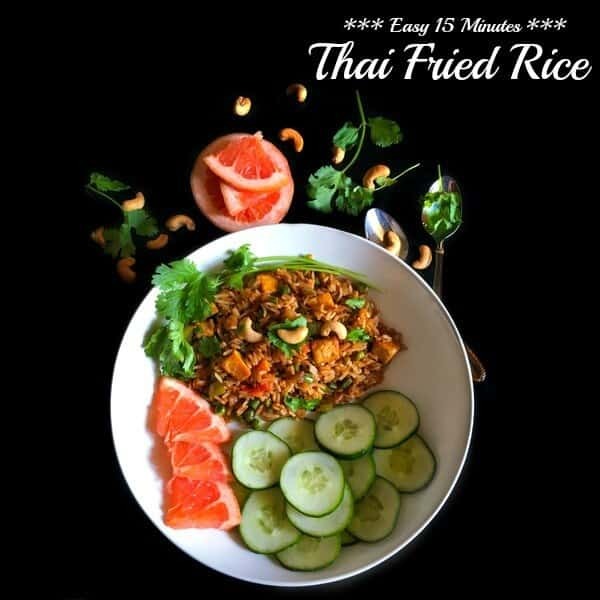 Love the thai flavors that you used for this. I will admit I am not a tofu fan, but maybe this might change my mind. I am a fan of these awesome little cubes. So easy to use, and I am not throwing out bad herbs that were not used up. Love grilling season…fire up the grill.. These are absolutely perfect and absolutely gorgeous! I cannot wait to make them. I have two vegetarians in my family and summer grilling is so hectic because I feel like we just grill the same thing over and over again. I have grilled tofu before, but I really feeling the thai basil flavours. Gotta make this very, very soon! I love the idea of Tofu skewers!! And I am love the color you have on these…! The Basic sounds so refreshing Molly! Cant’ wait to try this. Thanks Veena and I’m sure you’re going to love them. Yum! Love how amazing these look. Perfect for summer, cooking out, and having friends over! 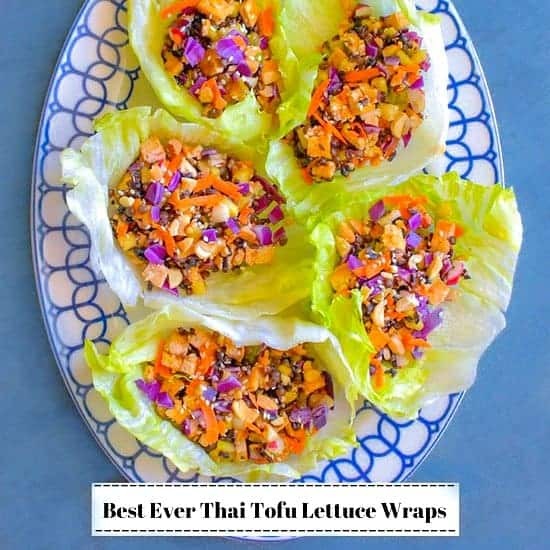 You always have the best recipes, I am not fan of tofu I have to confess but served like this I would eat it. So beautiful and those ingredients I bet make this tofu so tasty. Awee, thanks Adriana and I’m so glad you liked the recipe. I am literally dying to make these – the flavors are just so amazing! And that color! yumm!! !